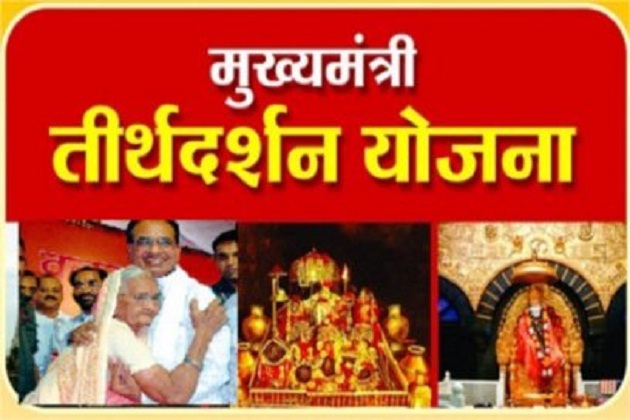 Mukhyamantri Teerth-Darshan Yojna. The State Government will extend one-time assistance in a lifetime to senior citizens above 60 years of age to visit a prescribed pilgrimage outside the state. Firstly, pilgrims will be sent under IRCTC (railway) package. The scheme got underway on September 3, 2012, with a journey to Rameshwaram. Pilgrim must be over 60 years of age and a domicile of Madhya Pradesh. He must not a taxpayer and should not have taken benefit of Teerth-Darshan Yojna earlier. Pilgrim should be physically and mentally sound to undertake the journey and should not be suffering from any communicable disease like TB, difficulty in breathing, heart disease, leprosy etc. The applicant providing false information and hiding facts can be deprived of benefit under the scheme anytime. A senior citizen desirous to avail benefit of Teerth-Darshan Yojna should fill up an application in prescribed proforma in two copies and submit the same at nearest tahsil or sub-tahsil before the prescribed time-limit. Photo and address proof should be affixed to the application. Ration card, Driving license, electricity bill, voters’ identity card or any other evidence recognized by the State Government will be accepted as address proof. Under the scheme, an attendant can also accompany pilgrim above 65 years of age. If one of the spouses is selected, his or her life partner can also go on pilgrimage. The life partner can undertake pilgrimage even if he or she is less than 60 years of age. Application of life partner will have to be submitted simultaneously. Similarly, attendants’ application should also be submitted simultaneously. If senior citizens submit an application in a group, then entire group will be regarded as one application and selected in the lottery. One group can consist of maximum 25 applicants including attendants. Selection of pilgrims will be made by the collector. First, applications will be sorted place-wise. Selection will be made through a lottery if applications outnumber quota. A waiting list of 10 percent quota will also be chalked out. If pilgrims desire to avail any other facility than prescribed by the government during the journey, then they will have to make payment for the same. Carrying any inflammable or intoxicating material or jewelry will not be allowed. The State Government will not be responsible for any accident during the journey. At present, the State Government has selected Shri Badrinath, Shri Kedarnath, Shri Jagannath Puri, Shri Dwarka Ji, Haridwar, Amarnath, Vaishno Devi, Shirdi, Tirupati, Ajmer Sharif, Kashi, Amritsar, Rameshwaram, Sammed Shikhar, Shravan Belgola and Belangi Church, Nagapattinam as pilgrimages under the scheme. As on April 30, 2013, as many as 98 thousand senior citizens have visited various centers of pilgrimage.